Whether with concrete, exteriors, roofs, infrastructure, scaffolding, to the finest trim and finish work, UBC carpentry professionals provide the crucial work on most every type of structure found in our world. From skyscrapers and hospitals to office buildings, prisons, schools, hotels, bridges, highways, infrastructure, and beyond, carpenters are responsible for bringing the blueprints for these structures to life. From foundations to finishes, professional carpenters are there. In fact, carpenters make up the largest single group of skilled workers in the country. Commercial and general carpentry professionals work with a variety of materials, in a variety of settings–indoor and outdoor, urban and rural, far above ground or below grade. UBC carpenters are skilled in layout, measuring, cutting, erecting, and joining materials together. Their work is used by our signatory contractors, who rely on the skills, productivity, and attitude of UBC members to deliver the quality of work that our contractors' customers have come to expect from a UBC crew. "Commercial and general carpentry professionals work with a variety of materials, in a variety of settings–indoor and outdoor, urban and rural, far above ground or below grade." 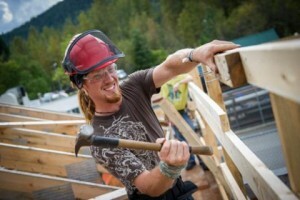 UBC general carpentry professionals are trained to work quickly, accurately, and safely at all times. Productivity is the primary goal. Training is done in both classroom and hands-on settings at state-of-the-art training centers around the country. Initial training for apprentices and skill enhancement courses for journeymen are taught by industry veterans or industry and manufacturer technical experts. Subjects range from basic skills to new technologies, tools and/or installation methods. This comprehensive training translates into unmatched productivity by UBC members for their employers. Safety is a critical component of our training. In conjunction with IHSA, we train for a variety of situations, so that our professionals are experts in job site safety, MSDS, mold and lead awareness, confined space, first aid and CPR, fall protection, ergonomics, and asbestos awareness.